This Thief purchased salvation from the Cross and made the kingdom of heaven his booty. He did violence to the Divine Majesty (like the wrestler Jacob) and prevailed not by his own power, but by faith; for the Lord himself hath said that the kingdom of heaven suffereth violence, and the violent man taketh it by force. The two crucified thieves may be taken as images of Jewry and heathendom; and then the Thief who repented becometh an image of the ingathering from heathendom, all which same had at first walked in darkness, but afterwards are come unto the knowledge of the truth. The thief who repented not becometh thus an image of Jewry that is still unbelieving. They trod together the path of sin until they came to the Cross, but the Cross parted them asunder. They were parted asunder on this wise: he that did not believe entered upon the path of darkness and destruction; and he that believed gained the path of salvation. The Thief upon the cross learnt the dividing of the ways; for the Lord knoweth the way of the righteous, but the way of the ungodly shall perish. Behold the just judgement of God, that thou mayest say with the Prophet, Righteous art thou, O Lord, and upright are thy judgements. For one sin was Adam condemned, and at one cry of faith was the Thief saved. One sin cast Adam out of paradise, one holy act brought in the Thief to dwell therein. Behold a marvel! Even unto Abraham was made no promise of paradise; because he believed God, he hath indeed inherited it; but it was never promised unto any until it was promised unto the good Thief. He did not see the Saviour seated on a kingly throne. He did not see him worshipped in a temple, speaking from heaven, or directing the ministry of Angels. Rather, he saw him as one numbered with the transgressors. He saw him suffering, and addressed him as though he were in glory. He saw him on the Cross and besought him as though he were enthroned in the heavens. He saw him condemned, and called upon him as his King, saying, Lord, remember me when thou comest into thy kingdom. Yea, he seeth Christ crucified and proclaimed himself subject to his royal Majesty. He beheld him hanging upon the Tree, and thought on the kingdom of heaven. Wondrous is the conversion of the Penitent Thief! ALMIGHTY and merciful God, who hast prepared a way of salvation for the wicked: graciously shew us thy love in the face of thine only-begotten Son Jesus Christ, whereby he drew unto himself the blessed Thief on the cross; that we likewise may be moved to true repentance, and attain the promise to be in Paradise with him, even the same Jesus Christ, thy Son, our Lord. Who liveth and reigneth with thee and Holy Ghost ever, one God, world without end. Amen. The Annunciation, also referred to as the Annunciation to the Blessed Virgen Mary. WE BESEECH THEE, O Lord, pour thy grace into our hearts: that, as we have knolwn the incarnation of thy Son Jesus Christ by the message of an Angel; so by his Cross and passion we may be brought unto the glory of his resurrection. Through the same Jesus Christ our Lord. The Archangel Gabriel announced onto Mary that she would bear God's only Son. Mary, being a godly woman, did not question the conception of Our Lord by the Holy Ghost in her womb, nor the enormous responsibility of being the Mother of God. She was rewarded for her faith in believing that . . ."with God nothing shall be impossible: And Mary said: Behold the handmaid of the Lord, be it unto me according to thy word." (The day's gospel, page E 44, The People's Anglican Missal). O GOD, who for the announcing of the mystery of thine Incarnation didst choose Saint Gabriel before all the other Angels: mercifully grant that as we do keep his feast here on earth; so also we may be assisted by his patronage in heaven. Who livest and reignest with the Father. BE ye therefore followers of God, as dear children; and walk in love, as Christ also hath loved us, and hath given himself for us an offering and a sacrifice to God for a sweet-smelling savour. But fornication, and all uncleanness, or covetousness, let it not be once named among you, as becometh saints; neither filthiness, nor foolish talking, nor jesting, which are not convenient: but rather giving of thanks. For this ye know, that no whoremonger, nor unclean person, nor covetous man, who is an idolater, hath any inheritance in the kingdom of Christ and of God. Let no man deceive you with vain words: for because of these things cometh the wrath of God upon the children of disobedience. Be not ye therefore partakers with them. For ye were sometimes darkness, but now are ye light in the Lord: walk as children of light: (for the fruit of the Spirit is in all goodness and righteousness and truth;) proving what is acceptable unto the Lord. And have no fellowship with the unfruitful works of darkness, but rather reprove them. For it is a shame even to speak of those things which are done of them in secret. But all things that are reproved are made manifest by the light: for whatsoever doth make manifest is light. Wherefore he saith, Awake thou that sleepest, and arise from the dead, and Christ shall give thee light. Benedict was born at Norcia in Umbria about the year 480. He is reputed to have been of noble birth and to have studied at Rome. Desiring to give himself wholly to Christ Jesus, he betook himself to a deep cave at a place called Subiaco, wherein he hid himself in prayer and contemplation for three years. But then his fame spread abroad, and some monks living nearby put themselves under him for guidance. Which same, it is said, turned against him because of his insistence upon complete dedication to God, and even plotted to poison him. But when Benedict made the Sign of the Cross over the cup, it brake. Whereupon the holy father left his unworthy monks and retired to a desert place alone. Nevertheless, disciples came to him again, and finally he established for them the famous Abbey of Monte Cassino, and set holy laws to govern them. Up until his time the monasteries in the West, for want of proper direction, had not flourished. The regulations which this father wrote are known as the Holy Rule, and in time nearly all the monasteries of Europe adopted the same, so that Saint Benedict became the Lawgiver and Patriarch of monks in the West as Saint Basil was in the East. The monks of Saint Benedict of later times, schooled under the Holy Rule, taught the barbarians of Europe to think and work, and to worship Christ. For which reason holy Benedict might well be called the father of western civilization. The little which we know of Saint Benedict, apart from his Rule, is to be found in Book II of the Dialogues of Saint Gregory the Great, wherein it is shewn that he was a man as loveable as he was great. He passed to God on the twenty-first of March, in the year 543, and the Mass composed in his honour is to be found in the Missal as the Common of Abbots. He was famous for prophecy and miracles, and two of his monks said that at his death they saw him going to God, clothed in glistering white raiment, and surrounded with light. GRANT, we beseech thee, O Lord, that the prayers of thy holy Abbot, blessed Benedict may commend us unto thee: that we, who have no power of ourselves to help ourselves, may by his advocacy find favor in thy sight. Through the same our Lord Jesus Christ, who liveth and reigneth with thee and the same Spirit ever, one God, world without end. Amen. We are now in the middle of the liturgical season of Trinitytide, which began with Trinity Sunday. 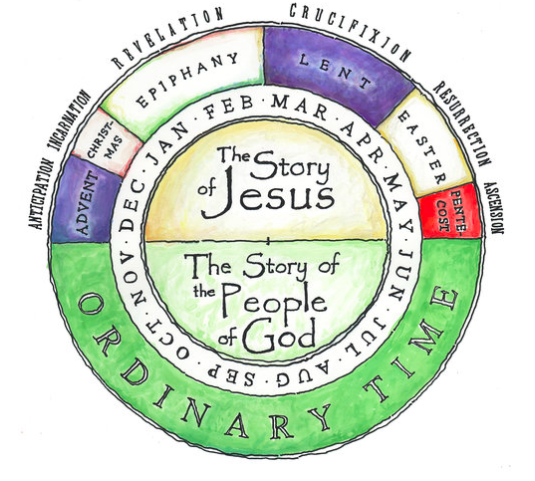 Trinity is the longest season of the church year, lasting throughout the summer and fall until the first Sunday of Advent. Its liturgical color is green, symbolizing growth. The collects on this page will be updated periodically with collects from Trinitytide throughout the season. BRETHREN, be followers together of me, and mark them which walk so as ye have us for an ensample. (For many walk, of whom I have told you often, and now tell you even weeping, that they are the enemies of the cross of Christ: whose end is destruction, whose god is their belly, and whose glory is in their shame, who mind earthly things.) For our citizenship is in heaven; from whence also we look for the Saviour, the Lord Jesus Christ: who shall change the body of our humiliation that it may be conformed unto the body of his glory, according to the working whereby he is able even to subject all things unto himself. WE give thanks to God and the Father of our Lord Jesus Christ, praying always for you, since we heard of your faith in Christ Jesus, and of the love which ye have to all the saints, for the hope which is laid up for you in heaven, whereof ye heard before in the word of the truth of the gospel; which is come unto you, as it is in all the world; and bringeth forth fruit, as it doth also in you, since the day ye heard of it, and knew the grace of God in truth: as ye also learned of Epaphras our dear fellowservant, who is for you a faithful minister of Christ; who also declared unto us your love in the Spirit. For this cause we also, since the day we heard it, do not cease to pray for you, and to desire that ye might be filled with the knowledge of his will in all wisdom and spiritual understanding; that ye might walk worthy of the Lord unto all pleasing, being fruitful in every good work, and increasing in the knowledge of God; strengthened with all might, according to his glorious power, unto all patience and long-suffering with joyfulness; giving thanks unto the Father, which hath made us meet to be partakers of the inheritance of the saints in light. WHEN Jesus then lifted up his eyes, and saw a great company come unto him, he saith unto Philip, Whence shall we buy bread, that these may eat? And this he said to prove him: for he himself knew what he would do. Philip answered him, Two hundred pennyworth of bread is not sufficient for them, that every one of them may take a little. One of his disciples, Andrew, Simon Peter’s brother, saith unto him, There is a lad here, which hath five barley loaves, and two small fishes: but what are they among so many? And Jesus said, Make the men sit down. Now there was much grass in the place. So the men sat down, in number about five thousand. And Jesus took the loaves; and when he had given thanks, he distributed to the disciples, and the disciples to them that were set down; and likewise of the fishes as much as they would. When they were filled, he said unto his disciples, Gather up the fragments that remain, that nothing be lost. Therefore they gathered them together, and filled twelve baskets with the fragments of the five barley loaves, which remained over and above unto them that had eaten. Then those men, when they had seen the miracle that Jesus did, said, This is of a truth that prophet that should come into the world. I THEREFORE, the prisoner of the Lord, beseech you that ye walk worthy of the vocation wherewith ye are called, with all lowliness and meekness, with long-suffering, forbearing one another in love; endeavouring to keep the unity of the Spirit in the bond of peace. There is one body, and one Spirit, even as ye are called in one hope of your calling; one Lord, one faith, one baptism, one God and Father of all, who is above all, and through all, and in you all.The Gospel. St. Luke xiv. 1. The Eighteenth Sunday after Trinity. LORD, we beseech thee, grant thy people grace to withstand the temptations of the world, the flesh, and the devil; and with pure hearts and minds to follow thee, the only God; through Jesus Christ our Lord. Amen. The Epistle. 1 Corinthians i. 4. The Gospel. St. Matthew xxii. 34. WHEN the Pharisees had heard that Jesus had put the Sadducees to silence, they were gathered together. Then one of them, which was a lawyer, asked him a question, tempting him, and saying, Master, which is the great commandment in the law? Jesus said unto him, Thou shalt love the Lord thy God with all thy heart, and with all thy soul, and with all thy mind. This is the first and great commandment. And the second is like unto it, Thou shalt love thy neighbour as thyself. On these two commandments hang all the law and the prophets. While the Pharisees were gathered together, Jesus asked them, saying, What think ye of Christ? whose son is he? They say unto him, The son of David. He saith unto them, How then doth David in spirit call him Lord, saying, The LORD said unto my Lord, Sit thou on my right hand, till I make thine enemies thy footstool? If David then call him Lord, how is he his son? And no man was able to answer him a word, neither durst any man from that day forth ask him any more questions. THIS I say therefore, and testify in the Lord, that yet henceforth walk not as other Gentiles walk, in the vanity of their mind, having the understanding darkened, being alienated from the life of God through the ignorance that is in them, because of the blindness of their heart: who being past feeling have given themselves over unto lasciviousness, to work all uncleanness with greediness. But ye have not so learned Christ; if so be that ye have heard him, and have been taught by him, as the truth is in Jesus: that ye put off concerning the former conversation the old man, which is corrupt according to the deceitful lusts; and be renewed in the spirit of your mind; and that ye put on the new man, which after God is created in righteousness and true holiness. Wherefore putting away lying, speak every man truth with his neighbour: for we are members one of another. Be ye angry, and sin not: let not the sun go down upon your wrath: neither give place to the devil. Let him that stole steal no more: but rather let him labour, working with his hands the thing which is good, that he may have to give to him that needeth. Let no corrupt communication proceed out of your mouth, but that which is good to the use of edifying, that it may minister grace unto the hearers. And grieve not the holy Spirit of God, whereby ye are sealed unto the day of redemption. Let all bitterness, and wrath, and anger, and clamour, and evil speaking, be put away from you, with all malice: and be ye kind one to another, tender-hearted, forgiving one another, even as God for Christ’s sake hath forgiven you. JESUS said, The kingdom of heaven is like unto a certain king, which made a marriage for his son, and sent forth his servants to call them that were bidden to the wedding: and they would not come. Again, he sent forth other servants, saying, Tell them which are bidden, Behold, I have prepared my dinner: my oxen and my fatlings are killed, and all things are ready: come unto the marriage. But they made light of it, and went their ways, one to his farm, another to his merchandise: and the remnant took his servants, and entreated them spitefully, and slew them. But when the king heard thereof, he was wroth: and he sent forth his armies, and destroyed those murderers, and burned up their city. Then saith he to his servants, The wedding is ready, but they which were bidden were not worthy. Go ye therefore into the highways, and as many as ye shall find, bid to the marriage. So those servants went out into the highways, and gathered together all as many as they found, both bad and good: and the wedding was furnished with guests. And when the king came in to see the guests, he saw there a man which had not on a wedding-garment: and he saith unto him, Friend, how camest thou in hither not having a wedding-garment? And he was speechless. Then said the king to the servants, Bind him hand and foot, and take him away, and cast him into outer darkness; there shall be weeping and gnashing of teeth. For many are called, but few are chosen. 46 There was a certain nobleman, whose son was sick at Capernaum.